The rack-mount solid state power amplifiers (SSPAs) designed for satellite up-link applications include a full-featured microprocessor based Monitor & Control, a serial-port interface (RS232 or 422/485), an Alpha Numerical Display and a remote gain control adjustment. 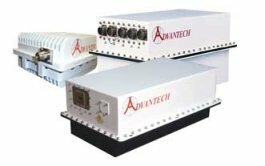 This model allows for a convenient redundancy topology (1:1 or 1:2) using Advantech's redundancy kit. As an option, our range of amplifiers can be equipped with an L-band input, which will be block-converted up to the output frequency. We call these products SSPBs. We can also supply amplifiers operating in the L-band. The hub-mount solid state power amplifiers (SSPAs) designed for satellite up-link applications include a full-featured microprocessor based Monitor & Control, serial-port interface (RS232 or 422/485) and remote gain control adjustment. This model allows for a convenient redundancy topology (1:1 or 1:2) using Advantech's redundancy kit. Our hub-mount amplifiers are also available in L and S satellite communication bands. The AWMA series: Includes a full-featured microprocessor based Monitor & Control and serial-port interface, for convenient redundancy topology (1:1 or 1:2) see Advantech's Redundancy Kits. All of Advantech AMT's solid state amplifiers with microprocessor controller (ARMA and AWMA Series) can be configured for redundant 1:1 or 1:2 operations. No external controller is required. For redundancy operations, in addition to the amplifiers (operating and standby), a special redundancy kit is required. The kit includes the waveguide switches, terminations, RF splitter, waveguide arms and interconnecting cables. A mounting frame is also required, please see the product list for more details. Access for full remote monitoring and control of the system is provided via the serial communication port. For 1:1 operations, two redundant ready amplifiers (ARMA and AWMA Series), one active and one standby, plus a 1:1 redundancy kit and a frame are required. The standard 1:1 redundant SSPA systems are configured to operate in the hot standby mode. The kit includes an input coaxial splitter. For 1:2 operations, three redundant ready amplifiers (ARMA and AWMA Series), two active and one standby, and a 1:2 redundancy kit and a frame are required. The standby amplifier will automatically replace a failed amplifier. Switch-over will not occur to a defective or missing amplifier. SSPB refers to Advantech AMT's line of hub-mount, block up-converter transmitters operating in the C, X, Ku and DBS bands. Used in conjunction with indoor L-band transceivers, SSPBs provide the utmost in convenience and efficiency. The SSPB is an integrated unit complete with power supply, phase-locked oscillator, mixer, filter and cooling mechanism. SSPBs are available for operation in any of the standard up-link frequency bands. SSPBs are also available for low output power (our 'mini' series). Advantech’s Low Noise Amplifiers are the low noise, high dynamic range amplifiers suitable for use in satellite earth station receiver applications where ultra low noise and high reliability are critical, as well as in other systems operating in S, C, X, Ku or Ka-bands. The LNA combines low noise with high linearity and wide band. Advantech AMT's Monitor & Control Panels are used in conjunction with 1:1, 1:2 and phase combined units to provide remote monitoring and control capabilities. The panel provides a convenient method to monitor the operation of the system. When started, each Monitor & Control Panel displays on its front panel the main menus.